Posted by David Boyce in NECA, Predator, Review with 2 comments. I have no idea when this review is going to hit due to so many being in the hopper at the moment. It may come out on Christmas, so if it does: Merry Christmas! If it doesn’t, Merry December 23rd! [Editor’s note: Or Merry December 26th!] Anyways, welcome to part two of three in my look at the Predator Series 16. NECA’s third helping of the Kenner inspired Predators. This time we are taking a look at the fabled (????) 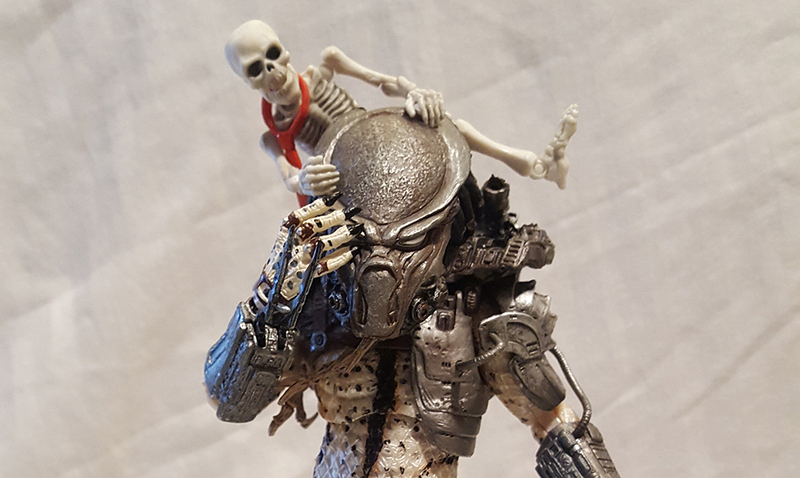 ‘Ghost Predator.‘ Truth be told, I have never seen the original Kenner version of him. After Googling for over half an hour, some responses on message boards said that he was an overseas exclusive, but I haven’t been able to verify that. If anyone actually has info on this let me know as it’s driving me crazy. The provided backstory for Ghost is interesting. He is hunting down Super Predators, the ones seen in the Topher Grace joint “Predators,” as revenge for killing his clan. He has become a fabled boogieman (Baba Yaga!) among the Super Predators, hence his name. I find it amusing that Predators would actually say ‘Boogieman’ amongst their peers. It would be even better if the Ghost stalked his prey while wearing a bed sheet over his head with two misshaped eye holes, and then had to awkwardly walk so he didn’t pull the sheet off of himself with his big feet. Staring at him for a few seconds after he was opened up I noticed he looks an awful lot like that new Ultimate Jungle Hunter that was teased at Comic Con this year. So after doing even more Google searches it appears that I’m right. Ghost is a retooled Jungle Hunter, and to be fair, the forthcoming Ultimate Jungle Hunter may very well be different from what we saw so far. This isn’t necessarily a pejorative but he is nowhere near as bombastic looking as the previous Kenner entries. He has some sickly pale skin with colorful tiger stripe highlights but that’s it. He doesn’t have neon pink dreads. No gigantic armor. No exotic accessories. Kind of the opposite of what the Kenner line was known for. This makes me think he didn’t exist previously and this is all a NECA fever dream. Ghost comes with a combistick, plasma caster, sword, smart disc, and a mask. That’s right! His mask is removable! In fact this entire wave of figures has removable masks. It seems NECA is mastering the ways of sculpting removable helmets without making the heads too big. I don’t know about anyone else but I’m drowning in Predator spears and combisticks, so it’s nice to see him come with a sword as an alternate melee weapon. At this point I could probably make an Olympic stadium diorama and have all my Predators compete in the Javelin competition. Bottom line? If you like any of the Predator figures NECA has produced, Ghost will be a solid addition to your clan. He can easily fit into the Predator 2 Lost Clan if you really want, but if you’re looking for something drastically different looking that the Kenner line is known for, then I’d say this would be a NAUGHTY let down. The Ghost Predator is currently available on Amazon! What Neca did to create Ghost is interesting, as he’s actually inspired by both ten-inch Predator figures that Kenner released in the ’90s. The first of which was brown plastic with minimal paint apps, but included gun metal blades and throwing disc. That one can be searched online under “Ultimate Hunter” fairly easily. After Kenner released their AvP line, they released a more color accurate version of the ten-inch Predator in a 2-pack along with an appropriate sized Alien. However, the blades were now black and there was no throwing disc. Both versions were unmasked. So, I think Neca did an impressive job designing a unique mask for this figure. The design team did an outstanding job, and it’s the only figure from this wave that I’m going to get! I love this one for a few reasons. Removable mask, new joints AND his left gauntlet opens up.